We’re big fans of collaboration around here! Collaboration in the longboarding and downhill skateboarding scenes allow us to grow as a community and as individual skaters. Without getting too sappy about all this collaboration goodness, we’re gonna jump right in to letting you know that we’re running an Artwork Design Contest with our friends at Sector 9 Skateboards! We’ve called upon the Sector 9 crew to produce a limited number of special edition Dropper MSX decks made exclusively for MuirSkate! Being that we spend the majority of our time on our boards (and assembling yours!) we figured it would be best to let a fellow skater and/or artist handle the graphical goodness on our behalf! This is where you come in; We need a graphic! There’s no official “prompt” for this graphic contest, but (as always) we’re lookin’ for something rad, bold, and exciting to slap on this deck! The only graphical requirement we’ve got for this contest is that the MuirSkate & Sector 9 logos must be present in all submissions. (You’ll get “bonus points” for incorporating the logos in a creative/natural way!) That’s a large enough “wall of text” for now… Read on for the specific details of this contest! The MuirSkate x Sector 9 Dropper MSX Artwork Design Contest has already begun and ends at 11:59pm PST on July 10th! Download the contest download pack. Get to work creating your masterpiece! If you work digitally, you can start right away in the Illustrator file or import it into Photoshop! (Just make sure to create your file at 300dpi!) Be sure that your artwork fills the entire "oval" space in the Dropper template to ensure proper coverage! If you prefer to work in the “analog” fashion (on paper), you may want to print out the template at 100% so you know just how much space you’re working with. (And when you scan it back in, be sure to scan it at the highest resolution possible so that you can have a crispy 300dpi final file!) Be sure that your artwork fills the entire "oval" space in the Dropper template to ensure proper coverage! Take whatever additional steps are necessary to ensure that your file is print ready upon submission. (This means separating the color layers if you’ve created your piece on paper and scanned it back into a Photoshop document… It could take a while depending on your comfort level, so get started sooner than later!) Be sure that your artwork fills the entire "oval" space in the Dropper template to ensure proper coverage! 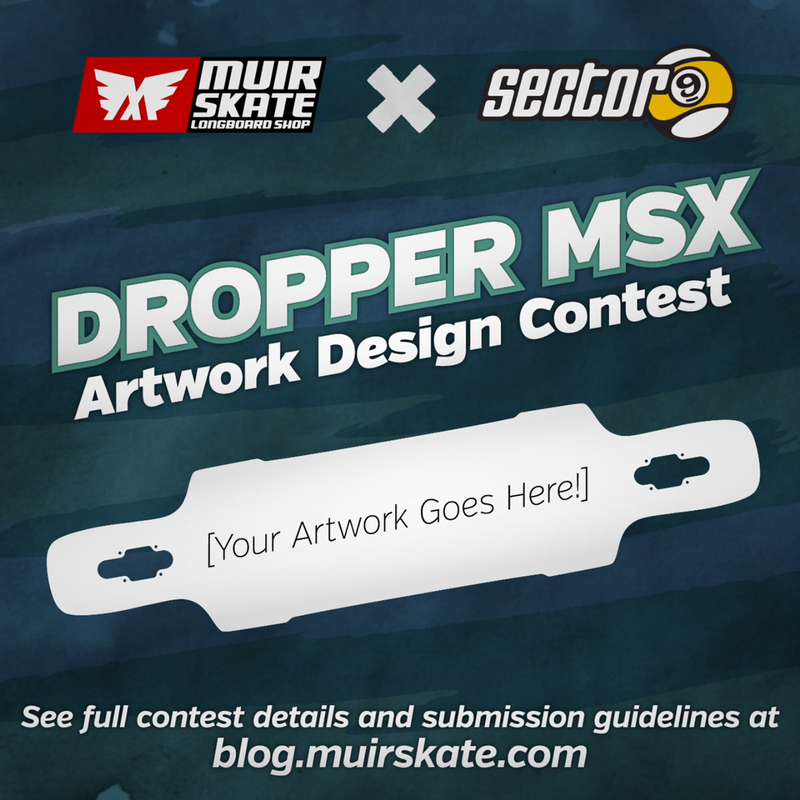 Email your full-res artwork (see technical guidelines below) as an attachment or via a DropBox/WeTransfer/GoogleDrive link to contests@muirskate.com with “Dropper MSX by [your name]” in the subject line. Wait patiently until the winner is announced on July 17th! Artwork submissions must make use of the “Dropper” template included in contest download pack. There is no limit to the number of colors that may be used! ends at 11:59pm PST on July 10th! Awesome contest idea. Did we ever find out who won? Look very cool. Impresive and beautiful board design. I will plan to buy this board next week :) tnx for post. Results? who won the contest? Looks like its been awhile, almost a year... Still available?